Imagine if you could build your own custom Android based smartphone from a list of different options and features. It looks as if a small handset maker from Germany planning on doing just that. In a already crowded Android market, it’s hard for a company to come up with something new and unique. 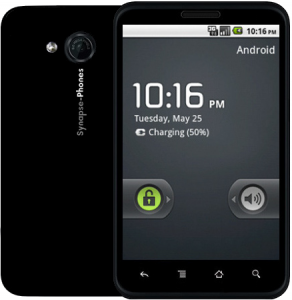 Synapse-Phones is just that company. Germany’s Synapse-Phones will build you a custom, rooted Android handset, exactly how you want it. the Synapse One will come with a standard 10.16cm chassis and a 4-inch super AMOLED multitouch screen, with 480×800 WVGA resolution. Also standard is a 1GHz processor, either a Qualcomm or T1 chip, with a 720p HD chipset. Again this wont be a customizable option, the company hasn’t decided on what chipset to use yet. GPS, Bluetooth and some other small features also will come standard. But after the standard chassis, pretty much everything else is customizable by you. You can choose from 4 different radio options either 3G an 4G capable, all of which will be compatible on the major US carriers networks (AT&T and T-Mobile). You can choose if you want WiFi b/g/n or not. You can pick from up to 3 different size cameras, the max being 12 megapixels. Another neat option is a ability to choose how much built in storage, and also how much RAM you want. Both give you three options to choose from. Then you can round out your phone with deciding what color you want, what size battery, if you need a front facing camera, and how big of a microSD card you need. There are some other options, but its all up to you. What features you need, or what features you want. After all of that customization, its gets built for you and comes loaded with Android 2.2. You also get a 3-year worldwide warranty. If that wasn’t enough, the phone will come already rooted, right out of the box. The base model phone will cost about $400, the middle of the line model will run you about $600, and the high-end model will set you back about $900. 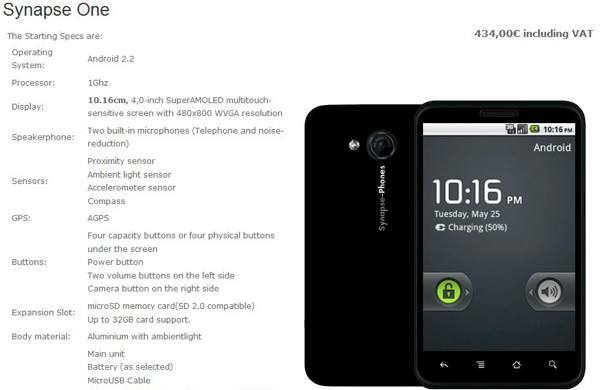 Synapse says you can pre-order now, but phones won’t start shipping till February 2011.